A couple weeks ago, my wife, kids, and I packed into the “family truckster,” i.e., our Sonata, and set off on our Annual Brkich Family Road-Trip Adventure. The first year took us to New England; last year it was the great Southeast. This year we decided to head west—Midwest, to be precise, to see what hidden treasures we could find amongst the cornfields. Having never driven further west than Dayton, I was curious and excited to see what we’d discover in America’s heartland. With the Sonata packed to the gills and fully fueled, we awoke the kiddos, strapped them into their carseats, and hit the road around 5 a.m. Not long afterward a gorgeous sunrise greeted us as we barreled westward down the Ohio Turnpike. In years past the kids slept through these early first hours of the trip. But this year we had a 20-inch TV strapped to the back of the front passenger’s seat, so they immediately went into Road-trip Mode, eschewing sleep to watch the first of what would be many DVDs. Our first stop was the Blue Ribbon diner in Wauseon, Ohio, just past Toledo. Here was one of those good old-fashioned roadside eateries with delicious greasy food and plenty of locals clad in John Deere hats, overalls, and camo. I enjoyed the generous Greek Skillet—a heaping helping of gyro meat, eggs, hash browns, and feta. Cass had something a little healthier, as she is wont to do, while the kids enjoyed their standard chocolate-chip flapjacks. Meanwhile our friendly waitress, who sounded just like Daphne, the froggy-voiced “fun girl” from The Andy Griffith Show, kept our mugs full with much-needed hot coffee. Nicely bloated and caffeinated, we hopped back into the Hyundai, and made our way through the rest of upper Ohio and then into Indiana. I knew the Midwest had a lot of farmland, but I was pleasantly surprised at just how much open land there is. It was just farm after farm after farm. As we moved into Michigan, we passed what must have been a country music festival, considering the inordinate number of pickup trucks and Confederate flags. At first I thought it a little strange to see Rebel flags so far north, but then I remembered we were in southern Michigan. 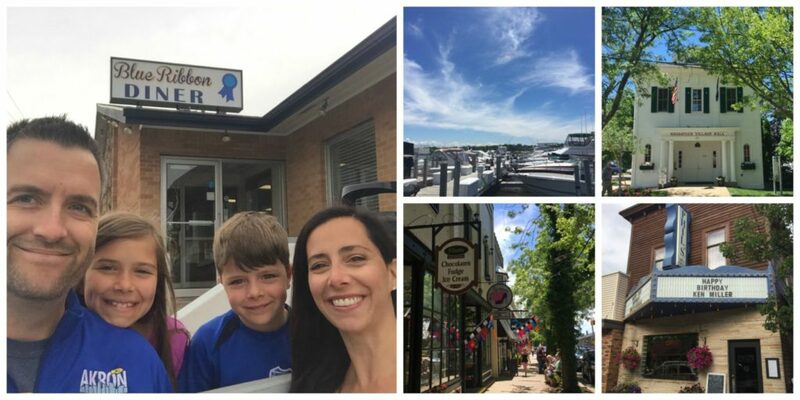 Around 1 p.m. we arrived at our first night’s destination—the charming lakeside community of Saugatuck. After all those hours on the lonely highway, what a pleasant change it was to pull into this lovely little village, its tree-lined streets alive with people browsing the dozens of quaint shops and eateries. As soon as we found a parking spot, we began exploring the town, making it to about five shops before being drawn into Kilwain’s for our first, but certainly not the last, ice cream of the trip. Shortly thereafter, The Animal purchased the first of what would be several new fidget spinners over the next two weeks. We strolled around for a couple hours until the kiddos (not to mention yours truly) had had enough of window shopping, and then headed less than a mile away to the Best Western. After letting the kids splash around in the pool (and Daddy enjoy a much deserved glass of Old Forester on the rocks), we headed back into town for dinner at Phil’s Bar & Grille, a neat little neighborhood eatery with good food a lively, welcoming atmosphere. A sign on the door said “No Phones Allowed,” a little rule to make sure people are actually conversing with each other. More restaurants should adopt the same rule. I, of course, had my typical vacation meal: a burger with fries. I washed it all down with a couple delicious beers: a Star Chicken Shotgun IPA from the local Greenbush Brewing Co., and a Moose Drool Brown Ale out of Big Sky Brewing in Montana. We made it back to the hotel a little before 8 p.m., but it had been a long day and this father decided to bid adieu to what had been a wonderful Father’s Day. So as Cass took the kids back down to the pool, I climbed into bed and fell blissfully asleep to a rerun of “American Pickers.” Day One of Road-Trip 2017 was in the bag. I awoke well-rested and began Day Two with the rest of my burger from the previous night, whilst the kiddos enjoyed their free continental breakfast. We hit the road around 10 a.m., and as we headed north along Rt. 31, wispy clouds floated across the baby blue sky, which, due to the flatness of the terrain, seemed to go on forever. Around noon we pulled off the highway for a little caffeine pick-me-up at Riverflats Coffee & Tea, and along the way we actually saw three deer crossing the road at, of all places, a deer crossing sign. About an hour or so later we had another pleasant surprise as we stumbled upon the historic, waterside town of Manistee. This lovely little community at the mouth of the Manistee River is just the kind of town my wife and I adore, with a long, old-fashioned main street featuring plenty of unique indie spots to shop and eat. Even more it has a refurbished old movie house — The Vogue Theatre — which had been completely restored in 2013 following a $2.6-million-dollar renovation project. While perusing Maryann’s Antiques, I stumbled upon a nice little selection of used LPs and ended up purchasing three, including “King Cool,” the 1981 release of Pittsburgh rock legend and Western PA native Donnie Iris. Score! 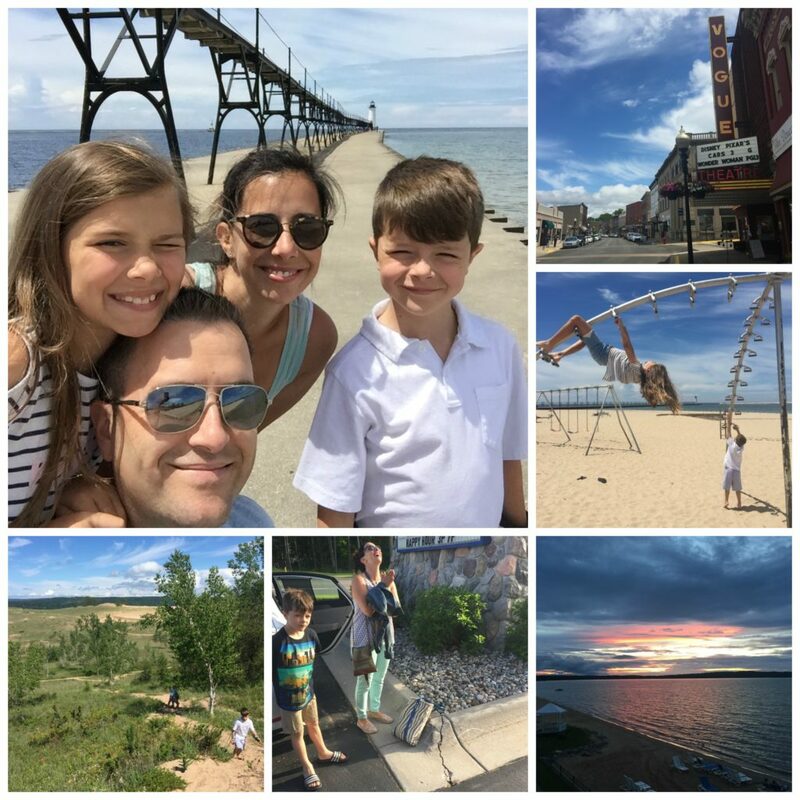 On a recommendation from one of the locals, before leaving Manistee we stopped briefly at the beach just outside of town, where the kiddos enjoyed an old-school playground, complete with one of those shiny old metal slides that can scorch the back of your legs on a hot summer’s day. This particular one was unusually tall, so much so that even big brave Daddy was a little weary of ambling to the top for a slide (but he still did). After that we hit the road for our next stop, the scenic Sleeping Bear Dunes, where we did a little hiking along the sandy trails before the heat of the sun and our thirst forced us back to our car. Finally we reached our second night’s stay at the Park Shore Resort in Traverse City, where we were pleased to find our room came with a balcony that overlooked the deep blue waters of the East Arm Grand Traverse Bay. It was still a little too early in the season, however, to brave the chilly water, so instead we let the kids burn off a little energy in the indoor pool. After that we headed downtown to Traverse City for dinner at the Mackinaw Brewing Company. But not before discovering Cassie’s work bag and MacBook sitting on the ground in the parking lot, where she had left it an hour or so before while unpacking the car. Luckily, as it turned out, Michigonians — and whoever else was sharing our hotel that night — are honest folk. The beer at the brewery was tasty, but someone from Western PA (preferably someone from Zooky’s in Fallston) really needs to teach them how to properly cook chicken wings, which should be crunchy, not chewy. After dinner we strolled around town and made another stop in a local Kilwain’s for ice cream before heading back to the hotel for some much needed rest. 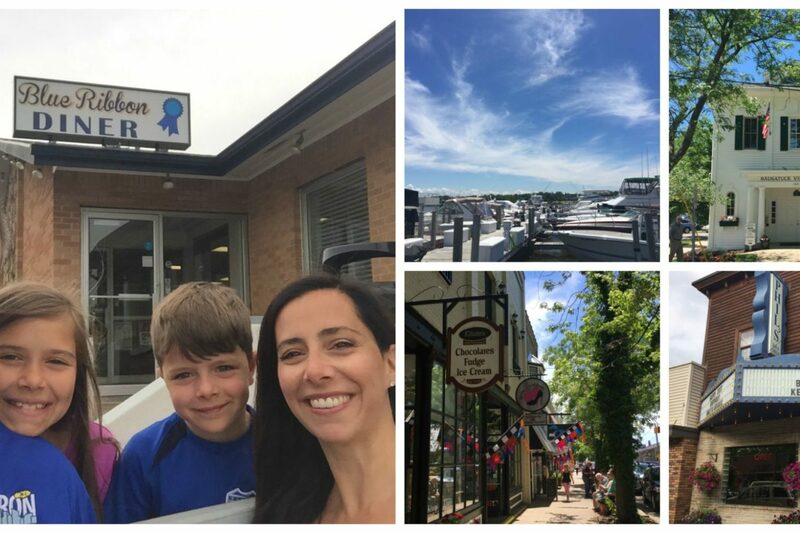 2 Responses to "Road Trip 2017: The Great Midwest, Part I — Saugatuck and Traverse City"
we really connect. Enjoy! P.S. Your kids look like carbon copies of each of you!